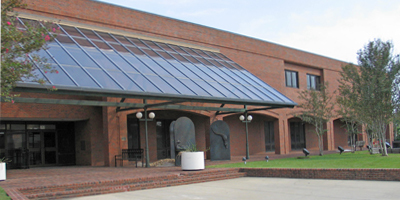 The Singing River Genealogy-Local History Library is located on the second floor of the Pascagoula Public Library which is located in downtown Pascagoula. The library is easily reached from U.S. Highway 90 and Interstate 10. LIBRARY HOURS: The Pascagoula Public Library is open from 9 a.m. to 8 p.m., Monday through Thursday, and from 9 a.m. to 4 p.m., Friday and Saturday. Customers may call the Genealogy and Local History Library at 228-769-3078 or ask questions by e-mail to: Amanda Brooks, genealogy branch manager. NEW! Use Ancestry.com @ Your Library! While on a public computer or on our WiFi, you can have access to more than 5 billion names in more than 4,000 genealogical databases including Census Records, Passenger Lists and UK & Ireland records. 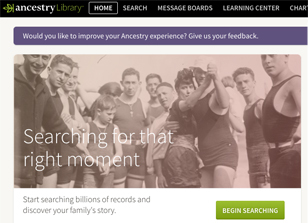 Use our Library version of Ancestry.com on your next visit! Let us assist you in your search for family, local, or regional information. Welcome to the Singing River Genealogy - Local History Library. Begun many years ago, the department has grown extensively during the past few years into a full-fledged library. Today, the collection continues to expand through increased purchases and donations and from the support of the Jackson County Historical and Genealogical Society and its members. NEW: Digital Archive is LIVE! The ability to have Singing River Genealogy-Local History Library’s collections at your fingertips is here with their New Digital Archive! The Singing River Digital Archive provides access to collection long hidden from the public. Through item records and creative exhibits, patrons can experience these materials from their school or home through the world-wide access public website. The library houses approximately 5,000 volumes which include: Family histories, Guides to genealogical research, Census indices, City directories, Cemetery records, State and county histories, Death records, Land records and much more. The collection is especially strong in Mississippi, Alabama and Louisiana material. Mississippi material consists of county histories and records, including a complete 22 volume set of Mississippi Cemetery and Bible Records covering the entire state as well as marriage records of every Mississippi county. Every effort is made to provide reasonable assistance to those needing it. Through a cooperative effort with the Jackson County Historical and Genealogical Society, volunteers will assist researchers in using the materials when staff is not on duty. Staff and volunteers can help researchers locate information on small communities which no longer exist, information on old houses, cemeteries, businesses and industries, and where and how to write for vital records. The Library is partnering with the Jackson County Historical and Genealogy Society which meets at the library's meeting room each month. Visit their new web-site at www.jchgs-ms.org. -- Read this article about Genealogical research on the Internet (click). -- Read a book on how to do genealogy research. -- Make notes on the names of parents, grandparents and other family members, including maiden names of wives, if known. -- Know the towns and counties where these people lived and the approximate time period of their residence in these places. -- To have a starting point, inquire about birth and death dates from family members and other sources. In our collection there are books on almost all other States and some foreign countries such as England, Ireland and Scotland. There are several books devoted to heraldry, including guides to the meanings of names and color illustrations of coats of arms and crests. Books in the collection are shelved according to subject or the state to which they pertain. Browsing the shelves is encouraged and wheelchair patrons will find the collection of resources easily accessible. A Locator File for Southeast Mississippi and Southwest Alabama is available for the period 1850 and prior. Alphabetical by surname, each card provides a location and any pertinent information available on the individual as well as various references to consult. An obituary index for local newspapers from 1873 through the present is also available.